"Muslim leaders denounce "intolerance" as lawmakers hold "Islamic Terrorism" event" was first published by The Texas Tribune, a nonprofit, nonpartisan media organization that informs Texans — and engages with them — about public policy, politics, government and statewide issues. "Our nation cannot be so overly sensitive in defending other cultures that we stop defending our own. The American constitution reigns supreme in our nation may that always be the case," Van Dyne said. In a 2015 interview with the Tribune, state Rep. Molly White said she didn't intend to ignite controversy with her comments last week about Muslims, but stood by her suspicions of the religion. In October, Biedermann invited, and then awkwardly uninvited, state lawmakers to a polo event amid ethical questions surrounding the offer, according to multiple sources familiar with the situation. Texas elected officials have a long history of making waves for comments about Muslims and Islam in America. Muslim leaders denounce "intolerance" as lawmakers hold "Islamic Terrorism" event By Alexa Ura and Sanya Mansoor January 26, 2017 Editor's note: This story has been updated. After receiving a letter from Republican state Rep. Kyle Biedermann surveying their beliefs, mosque leaders and representatives of the Texas Muslim community made one request: Get to know us. “We feel betrayed and singled out and absolutely discriminated against — that’s not what we expect from our elected officials,” Imam Yasir Fazaga of the Islamic Center of Brushy Creek said on Thursday while surrounded by a group of local interfaith leaders at the Texas Capitol. “The best way to overcome all of this is to get to know one another. We will not be intimidated by this tactic.” A few days out from Texas Muslim Capitol Day, an advocacy day for members of Muslim communities around the state, interfaith leaders forcefully denounced a letter sent by the freshman Republican to mosque leaders and Muslim student associations across the state asking them to fill out a poll about their beliefs. The poll — which Biedermann said was sent out to gather responses ahead of a “homeland security summit” that also took place on Thursday — asked Texas Muslims to indicate whether they support efforts to designate the Muslim Brotherhood as a foreign terrorist organization. The poll also asked respondents whether they supported the “Declaration of Muslim Reform Movement” and a pledge regarding the safety of former Muslims. But the Council on American-Islamic Relations, which puts on the advocacy day, contended that Biedermann’s intentions were to derail the upcoming event. On Thursday, Sarwat Hussain, president of the San Antonio chapter of CAIR, reiterated that organizers would move forward with the biennial tradition of bringing hundreds of Muslim Texans to the Capitol to learn about the political process and meet state lawmakers despite Biedermann’s poll, which she described as “reminiscent of McCarthyism.” “Get to know us. Be welcoming of us regardless of our faiths, gender, class or anything else,” Hussain said. “His intolerance of Texas Muslims is putting this segment of our state into a more vulnerable position. His treatment of Muslims is giving fuel to the fire of Islamophobia that is running rampant in our state.” The press conference appeared purposefully timed to overlap with Biedermann’s “homeland security summit,” which was promoted as focused on one topic: "Defending Against Radical Islamic Terrorism in Texas.” Meeting just four floors down from them in the Texas Capitol, Republican state representatives at the summit heard from seven speakers, including Irving mayor Beth Van Duyne, about concerns related to Sharia and unsubstantiated claims that the presence of mosques furthers radicalization. “Homeland security must be our top priority,” Biedermann said as he introduced the speakers. 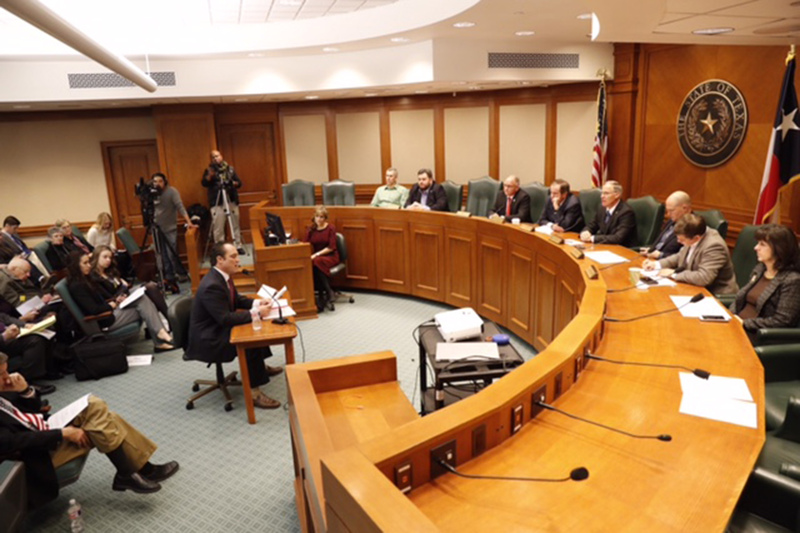 “We have a responsibility as Texans to secure the border and protect the state against serious growing threats of America.” Chris Gaubatz, vice-president of a group called "Understanding The Threat," speaks at a forum held in the Texas Capitol by newly sworn-in state Rep. Kyle Biedermann, R-Fredricksburg, on January 26, 2017.Bob Daemmrich for The Texas Tribune Van Dyne said she was called a racist, bigot and Islamophobe after she made public comments following rumors that a Muslim court was imposing Sharia in Irving. "Our nation cannot be so overly sensitive in defending other cultures that we stop defending our own. The American constitution reigns supreme in our nation may that always be the case," Van Dyne said. Several times throughout the forum, state Rep. Tony Tinderholt, R-Arlington, blamed the media for divisive coverage of Muslims that allowed Muslims to believe “they can create their own laws in America” and said he was “disgusted by it.” Biedermann added that he invited CAIR to the summit but received no response from the organization. Also present at the summit was former Republican state Rep. Molly White, who two years ago came under fire for leaving instructions for her staff to ask Muslim visitors to her office on Texas Muslim Capitol Day to declare allegiance to the United States. While White was not mentioned specifically at the interfaith press conference, Pastor Jim Rigby of St. Andrew’s Presbyterian Church indicated that Bierdermann’s tactics were not new among Texas lawmakers. “I’m so tired of having to come to the Capitol to protect my neighbors from politicians who use minority populations as scapegoats,” Rigby said. “The faces change but the rhetoric never.” Read more: In a 2015 interview with the Tribune, state Rep. Molly White said she didn't intend to ignite controversy with her comments last week about Muslims, but stood by her suspicions of the religion. In October, Biedermann invited, and then awkwardly uninvited, state lawmakers to a polo event amid ethical questions surrounding the offer, according to multiple sources familiar with the situation. Texas elected officials have a long history of making waves for comments about Muslims and Islam in America. "Muslim leaders denounce "intolerance" as lawmakers hold "Islamic Terrorism" event" was first published at by The Texas Tribune, a nonprofit, nonpartisan media organization that informs Texans — and engages with them — about public policy, politics, government and statewide issues. Link back to the original article, which is located at https://www.texastribune.org/2017/01/26/muslim-leaders-say-texas-lawmaker-betrayed-discrim/.